New Delhi: The Congress seems to be improving its vote share in Gujarat after years — from 38.9 per cent in 2012 and 32.9 per cent in 2014 to 41.4 per cent now. The BJP vote share is near its 2002 mark even as the number of seats won is coming down. 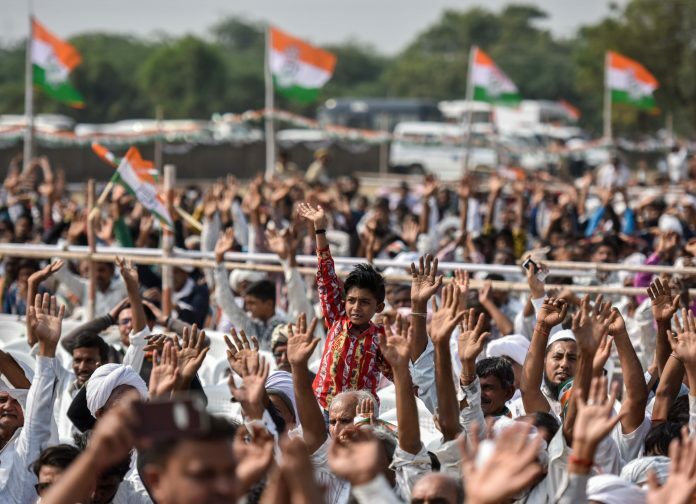 Early trends Monday indicate that the Congress could be — after more than a decade — looking at a significant revival of its fortunes in Gujarat and also be closing in on the gap in the vote share with arch-rival BJP. Even as counting was underway, the Congress vote share stood at 41.4 per cent against the BJP’s 49.3 per cent at noon. In 2014 Lok Sabha elections, the Congress had a 32.9 per cent vote share while in the 2012 Gujarat assembly election, it stood at 38.9 per cent. In 2007, the grand old party got 39.63 per cent. This indicates a near 7.5 percentage point gap in the vote share between the Congress and BJP in the 2017 polls — quite an improvement since the last rounds of elections. The gap was 9 percentage points in 2012. It was the highest at over 10.4 percentage points in the 2002 assembly election, held after the Godhra riots. In terms of seats, the Congress bagged 59 seats in 2012 against the BJP’ 115 and 59 again in 2007 against BJP’s 117. EC data so far projects that the Congress will win around 70 seats-plus, indicating a significant improvement for the party. The BJP’s numbers, incidentally, have come down since the 127 high in 2002 — the party bagged 117 seats in 2007, 115 in 2012 and could be even lower this year. However, its vote share stood at 49.25 at noon Monday. The last time that the BJP touched a higher figure was in 2002 when it recorded a vote share of 49.85 per cent. It was at 49.12 per cent in 2007 and 47.9 per cent in 2012 and 59.1 per cent in the 2014 Lok Sabha elections.